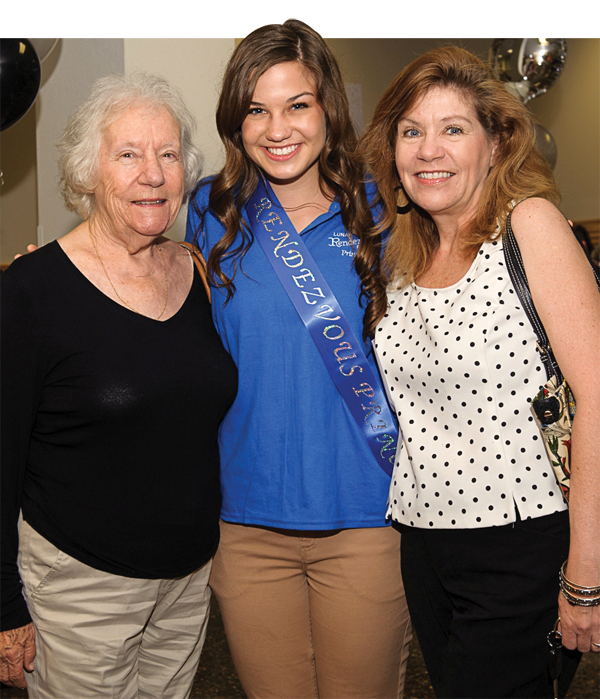 Lunar Rendezvous Festival General Chairman Terri Dieste, left, and Vice Chairman Jana Miller, right, join Festival Queen Caitlin Huston in congratulating Clear Creek ISD Superintendent Greg Smith on being chosen king of this year’s summer extravaganza. LUNAR RENDEZVOUS launched its 2013 festival with a kickoff party that featured the introduction of its new king and royal court and a roomful of smiles – one of two big spring celebrations. 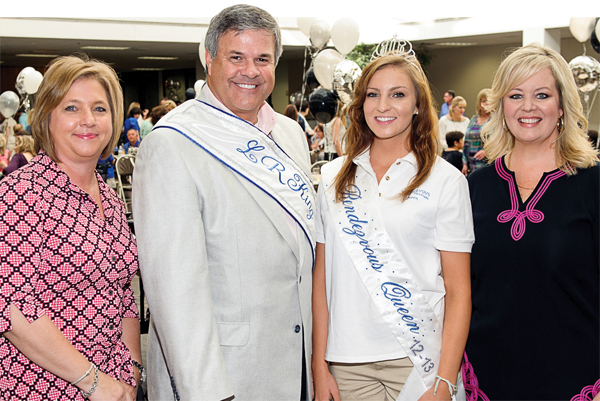 During a gathering in the UH-Clear Lake Bayou Building atrium that drew several hundred, the crowd cheered as Clear Creek ISD Superintendent and Texas Superintendent of the Year Dr. Greg Smith was introduced as the 2013 Lunar Rendezvous king. He was introduced by the 2012 king, Jay Gurry. He will join Queen Caitlan Huston, Queen Alternate Kristen Ann Bush, Capt. John Thomey and the royal court of princesses, lieutenants, little ladies in waiting and pages in reigning over the summer extravaganza which includes eight events – golf and tennis tournaments, a dining event, fashion show, sponsor appreciation party, religious service, 5K fun run and a coronation ball. 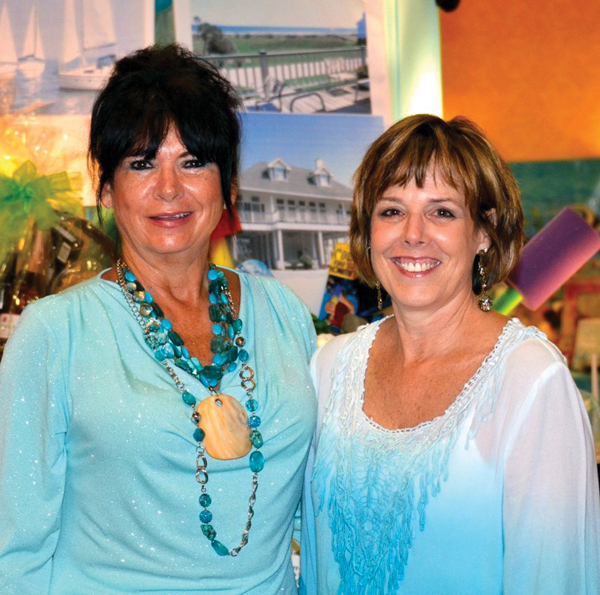 Coronation Ball Chairman Georgette Curran, right, and Co-Chairman Marla Magness Myers invite those attending to sign up to work on the final Lunar Rendezvous Festival event. Festival General Chairman Terri Dieste and Vice Chairman Jana Miller joined Kickoff Party Chairman Kimberley Weathers and Co-Chairman Donna Anderson in greeting the arriving crowd and introducing them to many of the event chairmen who had set up exhibits promoting their event and were busy signing up volunteers. Board of Directors Chairman Michael Landolt, Advisory Board Chairman Mike Reeves and Terri Dieste all welcomed the crowd when the program got under way. Princess Sofia Escalante has a hug for her mother, Julie Escalante, right, and her grandmother, Marcy Kirks, as they enjoy the Lunar Rendezvous Festival Kickoff Party at UH-Clear Lake. Coronation Ball July 27 at the San Luis Convention Center with Georgette Curran as chairman and Marla Magness Myers as co-chairman. 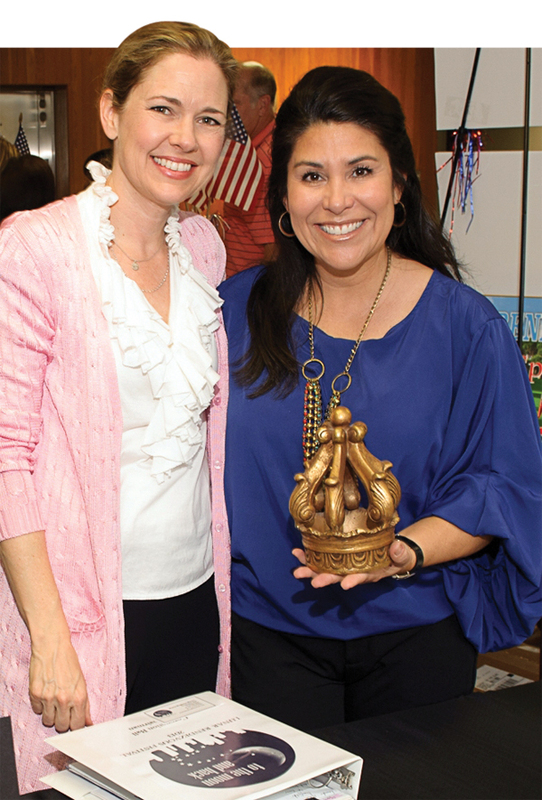 Others with key roles in this year’s festival include Treasurer Kelli Byrd; Court Chairman Angie Weinman with Ava Galt as co-chairman; Royals, Chairman Belinda Scheurich; Little Court, Chairman Denise Sanders; and Jill Smitherman, publicity chairman. Also assisting with the festival are Dinah Matthews, Lea Bodie, Lisa Holbrook, Jenny McCorkle, Marie Sharp and Sandi Quillen. 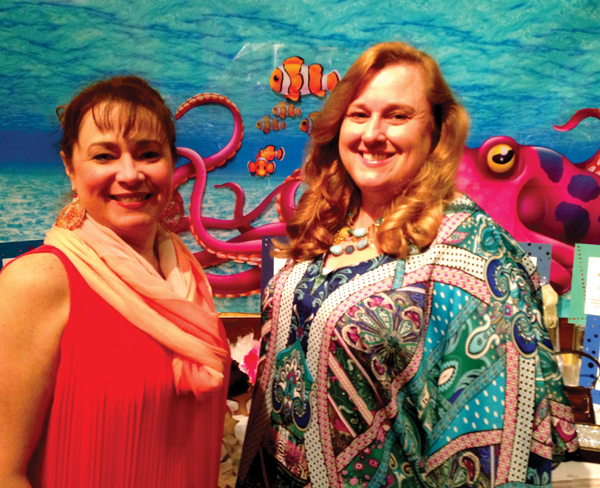 TALK ABOUT a smashing evening and you’d be talking about the Assistance League’s big Under the Sea Gala. It had a little of everything to keep the crowd in awe from the time they arrived on deck, then as they dined in the Hobby Marriott Ballroom in an “under the sea” setting – think Aquarium – and danced the night away to the music of Andy and the Dreamsicles until it was time for anchors up. But that’s just the way Gala Chairman Kathleen Courville and Vice Chairman Dee Cover planned it. They could hardly quit smiling as their husbands, Mike Courville and Stan Hermann, joined them and President Lisa Holbrook and President-elect Kim Barker in welcoming Jason and Lea Bodie, Keith and Elizabeth Clemente Nelson, Sheila Cooper and her husband, Dwayne Picou, Sue Ellen and Dr. John Jennings and Rob and Jennie Hampton. Assistance League President Lisa Holbrook, left, and President-elect Kim Barker check out the decorations as they prepare to greet the arriving crowd for the Under the Sea Gala at the Hobby Marriott. Sharon and Dr. Howard Dillard were among other early arrivals, as were Susan and Shawn Bailey, Diane and Deed Vest, Becky Reitz and John Gay, Tog and Suzie Rogers, Jason and Jenny McCorkle, Raleigh and Rita Johnson, Linda and Einar Goerland, Cynthia and Andrew Avrill, John and Georgia Piwonka and Badiha and Dr. John Nassar. They had hardly had time to take in all the nautical splendor when in walked Sheree and Norman Frede, Rob deCardenas and his wife, Dr. Heather Lindsay, Neerja and Rakesh Bhardwaj, Dan and Joan Burt, Drs. Gerry and Cindy Castille, Rick Lammers and his wife, Jill Williams, Ann Hammond, Sandra Sellers, Bob and Judy Raiford, Charles and Joy Smitherman and John and Jill Smitherman. Quickly followed by Curt and Vicki Tallman, Heather and Mike Rossiello, Linda and Pat McCormack, Dr. Melissa Sommers and her husband, Kevin Katz, John and Yvonne Bish, Russell and Sandy Vail, James and Peggy McBarron, Eric and Julie Pizzeck, Andry and Lisa Delhomme, Anita Fogtman, Jennifer Maxwell, Jenny Verghese, Gail and Stephen Ashby, Traci and Richard Dvorak, John and Suzanne McMannis and Baxter and Kathleen Killeen. Wasn’t long before you might have spotted Matthew and Angie Weinman, Thomas and Ann Marie Doolin, Mary and Bob Franklin, Pat Monks and his wife, Annette Dwyer, Stan and Cindy Senger Lewis, Kathleen and Thomas Pollard, Pat and Susan Lavergne, Mary and Nelson Fox and Tricia and Jeff Totten enjoying the yummy Grilled Filet stacked with Jumbo Citrus Shrimp, followed by Pam Culpepper, who came with her husband, Peter Cronk, conducting the live auction. And, so it went – just a delightful evening with proceeds to benefit the league’s philanthropic projects that have come to mean so much to the Bay Area Houston community.